MerchantCircle | Blog: Completing the Circle: Merchants and Consumers Unite! Completing the Circle: Merchants and Consumers Unite! No, this isn't a battle cry for X-Men, but more a completion of a dream 3 years in the making. With over 910,000 members, on its way to 1 million by the end of year, MerchantCircle has launched MerchantCircle "Neighbors" and MerchantCircle "Answers." After cracking 20 million unique consumer visitors each month to MerchantCircle listings, we knew consumers were routinely coming to MerchantCircle to find deals and their local business owners. 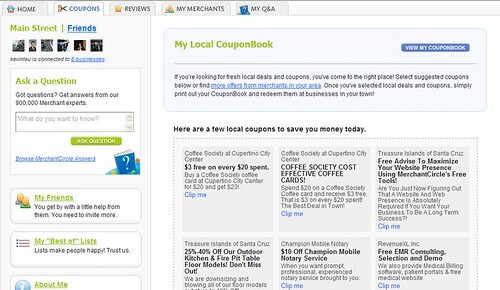 They needed ways to follow deals and coupons in real time, and clip certain coupons for rainy days. Therefore, we created Neighbors. Neighbors allows consumers to save deals from their favorite merchants, keep track of their reviews and ask questions from the nation's best local experts through MerchantCircle Answers. From questions about your cracked windshield, to questions about the best diapers to buy, MerchantCircle has local experts in every category. What's the best computer program to use to do my own taxes? Can I patch my flat tire up? Do I need to hire a lawyer to sue someone? Where can I find an honest auto mechanic? No question is too difficult amongst a group of almost a million members! We're ecstatic about this next phase of MerchantCircle that truly connects local consumers with local business owners. No where else on the web can you find such an engaging, easy-to-use experience that allows you to communicate seamlessly with your local business owners and experts. Finding and giving deals was never so easy! And remember, merchants are consumers too, so start your Neighbors profile today and start saving money. To read more on the release, click here. This is a awesome feature. 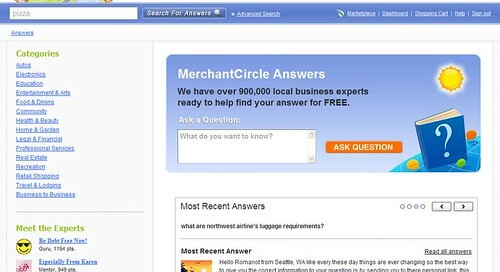 No other web information service has this feature that you can go straight to merchants on the website and immediately have a question answered....right away. I think this is great and will take off quickly. Congrads to Merchant Circle on achieving....first the idea and now the reality. Good luck!! Having neighbors at MC is a great idea! Yahoo! just launched something similar last week-- confirming the need for local community members to interact and share answers.